Most of the 23 discs that make up the human spine are in the middle back (thoracic spine) area. However, it’s the spongy supportive structures in the neck and lower back that often contribute to disc-related pain because spinal discs in these areas are more flexible and less protected than mid-spine discs. If you experience issues with any of your intervertebral discs, you may reach a point where your daily movements and activities are affected. To give you a better understanding of what could be causing your discomfort, let’s take a moment to explore the ABCs of disc pain. Sometimes the soft inner disc material pushes through the harder outside part of a spinal disc. When this happens, it’s known as a herniated disc. Symptoms are similar to what may be experienced with a bulging disc. Consulting with a Los Angeles spine surgeon can help you determine the cause of your symptoms and how best to treat them. Some people have discs that are damaged but only causing minimal or mild discomfort. If this is the case, medication, activity modification, and physical therapy may be effective. When symptoms are severe, don’t go away with conservative (non-surgical) treatments, or result in pain extending to legs, arms, or shoulders, surgery may be necessary. 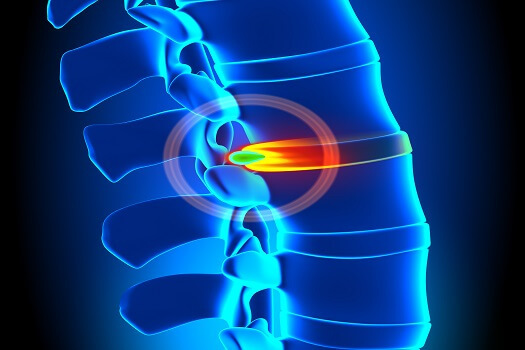 Options include removing part of the damaged disc (microdiscectomy), removing the entire disc and limiting motion in the affected area (spinal fusion), and replacing the disc with an artificial one (artificial disc replacement). If you have pain you think may be resulting from disc issues, you don’t have to suffer needlessly. The spinal health experts at The Spine Institute know all about how to ease pain caused by damaged or weakened discs. We specialize in every aspect of spinal health, from preventive care to back fusion alternatives. Los Angeles residents should call us today at 310-828-7757 for more information or to schedule a consultation.